Thursday 29th May 2014 – 5.45pm – Jamie Arrowsmith. A ten-month campaign to ‘Keep Oswestry Alive’ resulted in five life-saving defibrillators being unveiled in the town on Tuesday. The public access defibrillators have been funded by the community through a variety of fund-raising schemes and donations, led by the Oswestry and Border Chronicle’s campaign, which ran in conjunction with West Midlands Ambulance Service (WMAS) and the British Heart Foundation. Defibrillators located at the Senior Citizens Club in Lorne Street, Powis Hall, the Wynnstay Hotel in Church Street and the Chronicle Office in Salop Road are accessible 24 hours a day, whilst a fifth device, which is kept in the offices of the Principality Building Society in Leg Street, is available during office hours. Staff members at all venues have been given training in how to use the devices by WMAS Community Paramedic Officer Terry Foster, who explained the importance of the devices in helping to save lives. “The quicker a defibrillator shock can be done, the greater chance a patient in cardiac arrest has of surviving. “For every minute a patient is in cardiac arrest their chance of survival decreases by ten per cent, so the importance of these defibrillators cannot be underestimated. The British Heart Foundation’s Warren Appleby added: “We are delighted to be associated with the campaign and to help provide exactly what is needed in Oswestry, vital equipment in key locations. Graham Breeze, Oswestry Chronicle Associate Editor, said: “We are thankful to lots of very generous people for supporting our campaign so well. “Thanks to a number of donations from local businesses and organisations, together with a variety of fund-raising events, we managed to raise almost £6000 which allowed us to reach our target of purchasing five defibrillators. 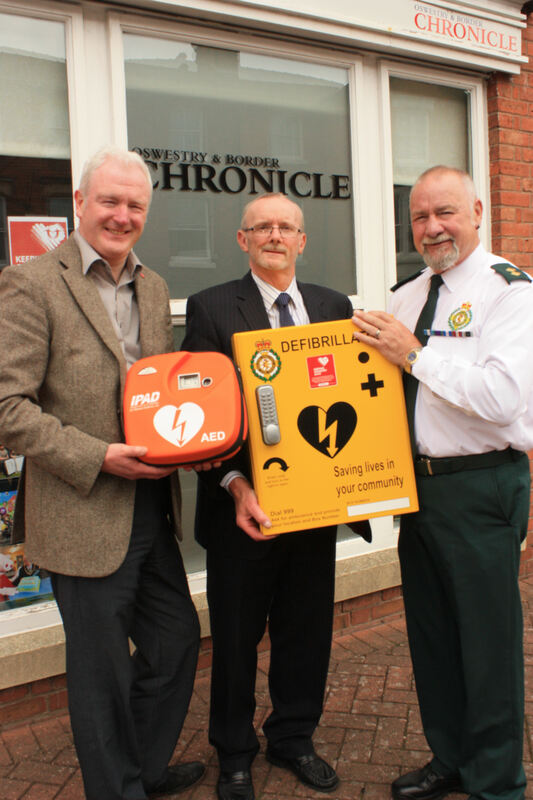 Warren Appleby (BHF – left) and Terry Foster (WMAS – right) present Graham Breeze (Oswestry Chronicle – middle) with the defibrillator. 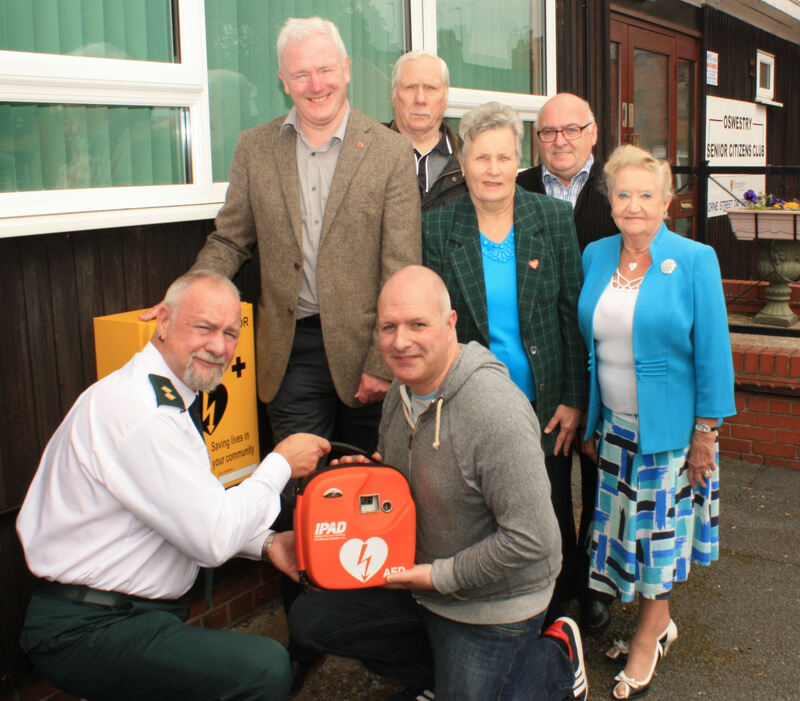 Terry Foster (WMAS – front left) and David Lee-Birch (Oswestry Chronicle – front right) put the defibrillator in place at the Senior Citizens Club in front of (l-r) Warren Appleby (BHF), Ian Morris, Anne Wilson, Mike Smith and Margaret Howell. 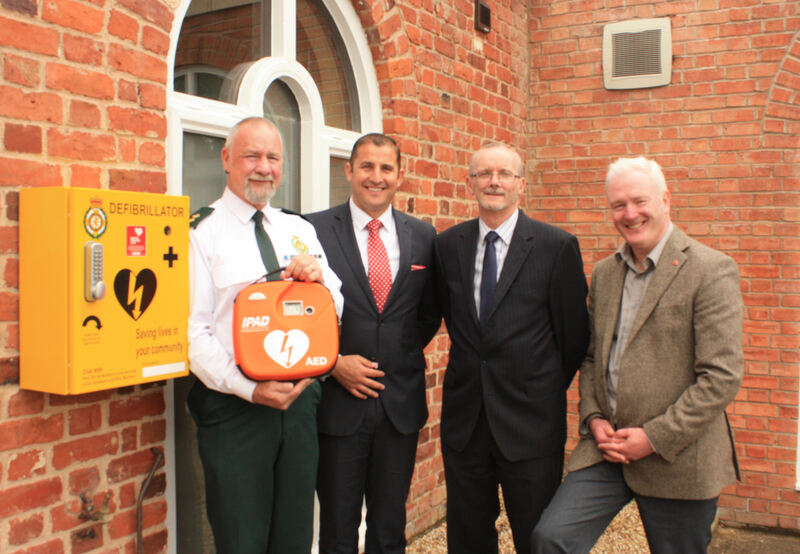 Hotel manager Sebastian Siddi (second left) accepts the defibrillator from Terry Foster (WMAS – left), Graham Breeze (Oswestry Chronicle – second right) and Warren Appleby (BHF – right). 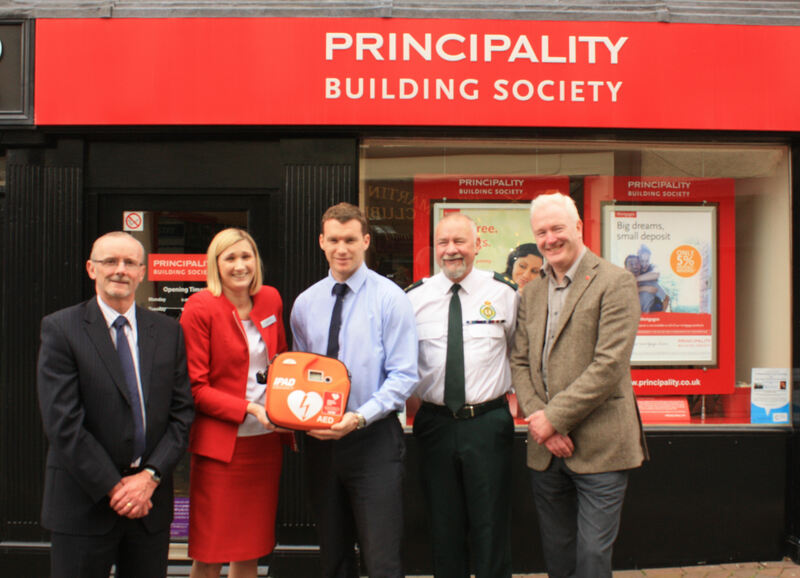 Principality Building Society Branch Manager Harriet Fallon (second left) and Sales Negotiator Daniel Graham (middle) take possession of the defibrillator from Graham Breeze (Oswestry Chronicle – left), Terry Foster (WMAS – second right) and Warren Appleby (BHF – right). 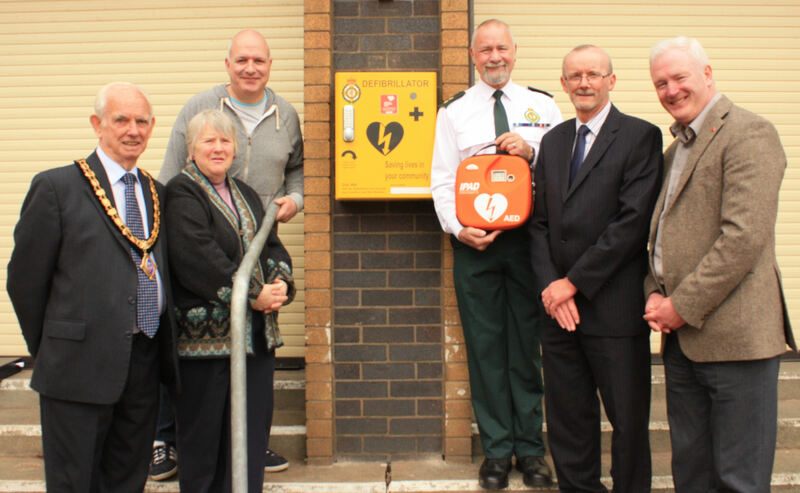 From the left – Mayor of Oswestry John Gareth Jones, Cynthia Hawksley (Chairman of Car Parks and Markets), David Lee-Birch (Oswestry Chronicle), Terry Foster (WMAS), Graham Breeze (Oswestry Chronicle) and Warren Appleby (BHF) put the defibrillator in place at Powis Hall. All pictures should be credited to West Midlands Ambulance Service.